The Astronomy Picture of the Day web site highlighted this photo today of what looks like a daytime sky from another planet. It was actually taken of our daytime sky using a small refracting telescope; The small crescent is Venus, and the larger one is the moon. Click on the image to see a higher resolution version, and find all the details on how the image was taken here. 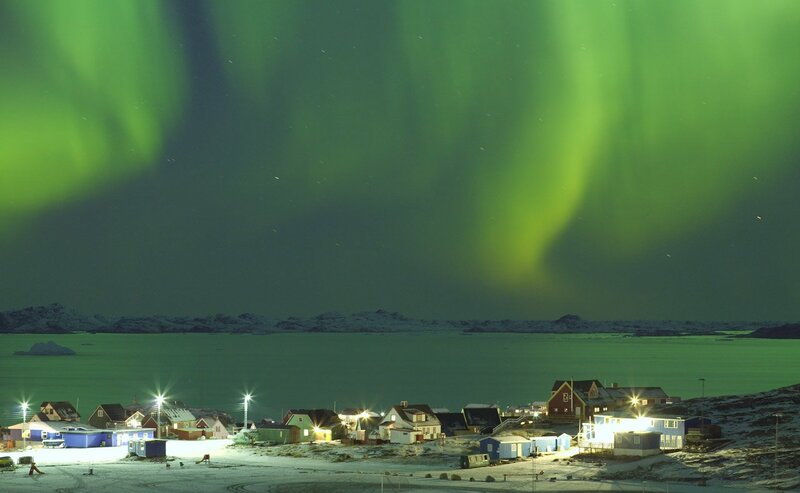 Space Weather had an excellent photo of the auroras over Nuuk Greenland when the solar winds hit the earth’s magnetosphere last night. At first glance, it doesn’t really look like a snowflake. 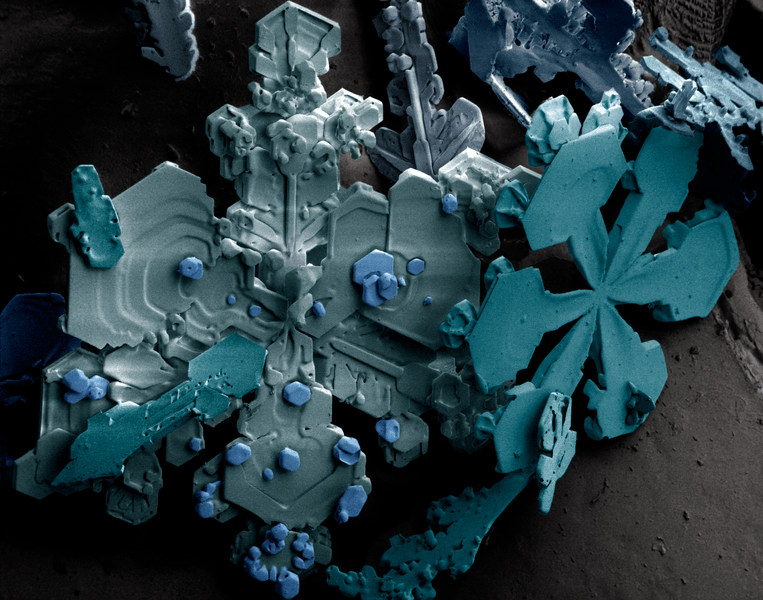 In actuality, it is an image of several snowflakes of differing conformation (I counted about eight different varieties) that have been sputter coated with platinum at a very low temperature (in order to make them conductive) and then imaged with a Scanning Electron Microscope equipped with a low temperature stage. The resulting gray-scale image formed by the electron beam was then digitally colored just as the old black and white movies have been “colorized” to result in the above “false color” image. Here’s a picture of the specific unit that was used to take this image. Check out more details on the equipment here, and the original source of the snowflake crystals images here, and here. Check out the latest Hubble photo showing the same stellar explosion from V838, Monocerotis and its evolution since 2005. From the Hubble Web site: “These are the most recent NASA Hubble Space Telescope views of an unusual phenomenon in space called a light echo. Light from a star that erupted nearly five years ago continues propagating outward through a cloud of dust surrounding the star. The light reflects or “echoes” off the dust and then travels to Earth. The Make Magazine web site pointed me to this great open house activity that the Electrical Engineering department over at WUSTL put on for potential incoming freshmen. Students could show up and build their own light-activated robot with a few dollars worth of parts in about 30 minutes using absolutely no tools whatsoever. And they got to take their new pet home when they were finished with version 1.0. Using the paint roller drive wheel vs. motor shaft ratio of diameters as an effective gear reduction is a bit of creative genius. Given that there are only ten or so parts and the instructions are only a page long, I’m thinking this one could be useful even in late elementary school. Some early prep work was necessary to hot-glue the breadboards to the paint rollers, and perhaps solder the connectors onto the battery leads. But intrepid students could easily figure that part out for a longer classroom activity. I just love this photo from the web site of one student “walking their robot” and leading it with a flashlight. A government report based on data from the Census Bureau has determined that a bachelor’s degree is worth about $23,000 a year, with college graduates earning and average of $51,554 in 2004 compared with $28,645 for those with only a high school diploma. If you carry that yearly salary difference through retirement age, you end up with a total difference of about $1.2M. High School dropouts earned an average of $19,169 a year, and those with advanced college degrees earned an average of $78,093. It seems like a no-brainer to me, specially when you consider some of my buddies who have turned what they learned into economic engines worth billions of dollars as an up-side. Of course there is a down side, but according to the large-scale statistics, even Joe-average is best served staying in school a little longer.